While writing we need to play around with words. Synonym (same or similar) words come real handy while writing piece to covey same meaning but using more simple words. If you are an internet person, then there is no need to flip pages of your dictionary book – just head over to Google Search. 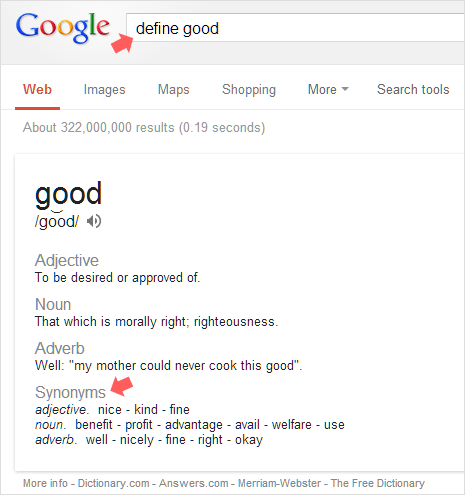 Ideally one would assume, for finding synonym of word “good” – type “synonym good” in Google Search. Unfortunately this does not give a direct answer. This search query merely show search results for websites explaining synonym words for “good”. 1. For more direct answer right on Google Search result page, just type define in front of search keyword. For example type “define good” in the search box and check the search results. Google explicitly displays synonym words for the query at bottom of definition box on results page. 2. You can also use “synonyms for good” or “synonym for good” or “definition good” or “good definition” for same type of results. Out of all options, define is most remember-able and easy to use (not many of us spell synonym as a word correctly, so define can be used). So next time you are searching for noun, adjective, adverb and synonyms of a word – just use define in front of specific word in Google Search for instant results.